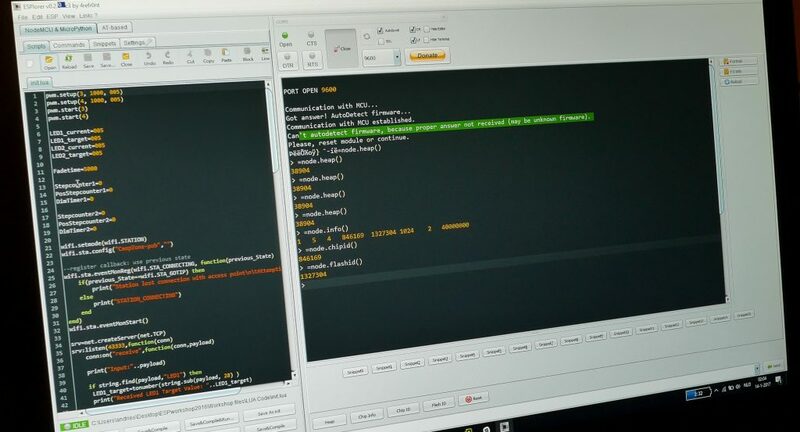 It’s been a while since the last article and video about the ESP8266 but finally the article and video on how how to program QuinLED and then control it from your PC is here! As is now quite common I’ve made a detailed video about how to flash, program and then control the board. I will type it out in text form in this article too, but being able to see how it works always works best in my opinion! New boards designs coming soon! Currently, all DirtyPCB links are down because of a change to their website, coincidentally we also moved to the new house and officially don’t have any internet yet which is why the FTP site is ALSO down. So currently there is no way to order boards. I have been working on a slightly optimized and updated board design though. I already have the first “print” in and just need to make a few corrections to it before it can be released into the world. So hold on just a bit longer, I should have them available soon! I have uploaded an updated ZIP file which contains all the programs, firmware and code you are going to need to use QuinLED. Click the giant icon below to start the download. Since the last article I’ve acquired some convenient little USB adapters with a serial chip on-board which allow you to plug in and run an ESP-01 directly from your USB port. This saves a lot of time because you don’t have to fiddle with serial wires and such. Once you are done programming it, just plug it into a QuinLED board and you are done! As can be seen in the video I have multiple of these little adapters of which I have modded one to always be in “flash mode”. That way I can very quickly flash an ESP-01, then plug it into a normal USB adapter, program it and them move it over to QuinLED. I can certainly recommend getting a few of these! You can get them here. If you are uncomfortable soldering one yourself, you could also get this version which has a flash button on it! Once you’ve flashed the ESP-01 you want to use on the QuinLED board (either using serial wires or the USB adapter) open up ESPlorer. You will need to have Java installed for it to work. ESPlorer should automatically detect the COM port your ESP is connect to, if not, select the right port and click op “open”. That should open the serial port and make the connection with the ESP-01 module. Hit the “heap” button (lower part of the window) a few times and see if you get a response back. Often the first and second time will be a bit of garbage but after that it should work. I’ve prepared a “init.lua” file which holds the whole program needed to have the ESP-01 make a network connection and perform the dimming functions. 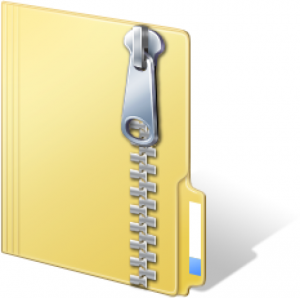 In ESPlorer click the open file button and load the “init.lua” file included in the ZIP file. That’s a very high level over view, but this series isn’t about programming! This is the line we need to change to match the settings for your home WiFi network. To save the code to the ESP-01, hit the “Save to ESP” button below the code screen. This will start the transfer of the code line for line to the ESP-01 module. After that’s done, hit “Save&Compile” and when that completes hit the “Reset” button. 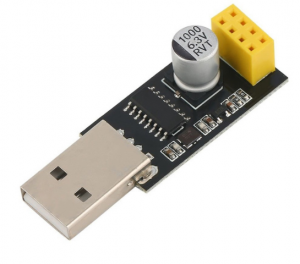 Now your ESP-01 will be running the new code and should be connected to your WiFi network! The code uses DHCP to ask an IP from the WiFi network. But which IP did the ESP-01 get? The module will report back which IP it got. Try and ping it to see if you can reach it! 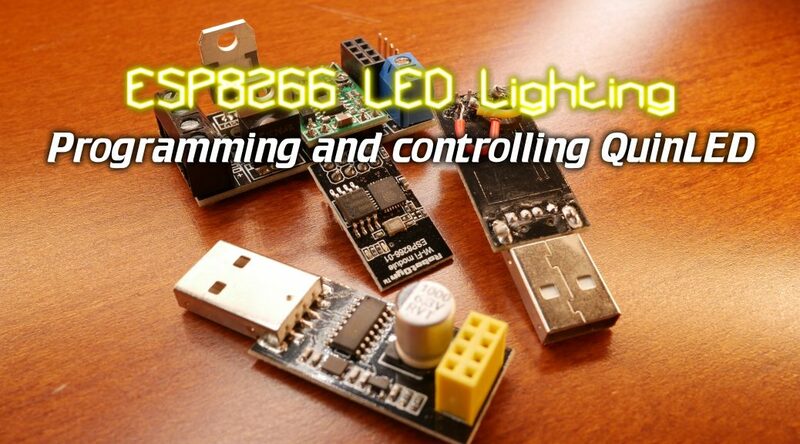 Now that programming is done, the next step is controlling QuinLED to dim your LED lights! To control QuinLED I make use of a program called Netcat. This is a little tool which uses TCP sockets to send text data to another network device. In the case of my QuinLED code this is using TCP 43333. There is no official way to install Netcat (or NC for short). Mostly I just dump the entire contents of the ZIP file (included in the ZIP file above) into a directory that’s in the path (such as c:\windows\system32). After that you can run the command from anywhere but just calling “nc.exe”. In the ZIP file I have also included the command line way to send dimming commands to QuinLED! Fill in the correct IP number where it says IP.IP.IP.IP and try to see if the command works. If the ESP-01 receives the commands you should see some status messages scroll in the output window of ESPlorer. If you did, that means everything is working and you are ready to connect the ESP-01 module to the QuinLED board. Or if it was already on there, you should have seen any connected LED strip dim to the desired value! And that should be it, you now have a fully WiFi network controllable LED dimmer! Next in this series is how to use the same setup and connect everything to Domoticz given it all a nice front-end and automation capabilities! Hi, Really love your project and have come to many of the same conclusions as you independently in terms of component choice and layout. Most of my troubles came from high mosfet threshold voltage which threw me a bit… We deviate a little in terms of software choice etc but the outcome is the same. Except I’m only at prototyping board level… Really learning a lot from your pcb posts and now checking out your youtube links so I can print some v2.5 rev 1.12 pcbs. I’m having troubles finding a good link for fritzing or dirtyPCB that is still live. Would love your help on that. With the new USB adapter I could successful flash the ESP. And I can now dim the LEDstrip from the command prompt. I am looking forward for your next video with the connection to Domoticz. Hii i’m getting tjhis error: when save&compile after Save To Esp. The error was to not select the firmware *.bin on the flasher, now when i flash the correct firmware, of the package, on reset the esp8266 it starts to sending data with compilation error..
I’ve tried fixing this in a number of ways including using (a) all of your workshop files, firmware and init.lua code (b) more recent builds of firmware (both master, dev and debug but always Integer builds – never float) and updating init.lua (in init2017.lua) reflecting updated versions of libary (especially wifi config). The problem seems to be in the “tonumber” part of line 44 which returns a null. Just out of interest, does your implementation still work or are there a big changes in the required firmware build. Sorry, but I’m not a coder but reasonably good at following someone elses guide but have run out of ideas as to what to try next to get my PWM dimming working again. Let me know if can help and if you’d like more details of my setup. I’ve found the problem that I was experiencing. It was down to the loaction of 28 chars to find the number for LED1_target. 28 chars into the payload was actually pointing at the “=” sign so replaced 28 with 29 and it worked. …but to get to this point, I used a new firmware build and had to update some of the wifi module calls to reflect more up to date usage in LUA 5.1. …and also replaced the hard definition of 29 chars by a call to string.find that returned the location of the “=” char, so just added 1 to it to get the number value to be converted by tonumber. e.g. The only problem i now have is that I I still can’t get the LEDs to light-up or dim but think that’s an electrical issue. Interesting to investigate this as it’s been many years since having touched any c-code. hi , it is possible to configure a static ip?? Yes, sure, that’s a very easy change. Personally I leave it on DHCP and set a static lease on my DHCP server/router. You considered making an zigbee version of the quinled as’well? does anyone have this working in Home Assistant? I’m using scripts to control the brightness and would love to use a slider. adjusting it to the minimum, always ‘a lot of light …. and’ can adjust the range?